It's time to share how we're building our pantries with $5 or less. Remember this $5 is not part of the weekly groceries budget. 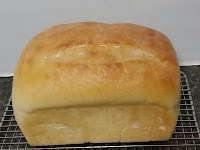 It is set aside to be used just for stocking up in any area of our pantries. 5 cans of cherry filling/topping from The Dollar Tree ($1 per can). I wasn't sure about the brand but after trying it, we were very pleased with it. What did you add to your pantry this week with your $5 allotment? Did you know that every time you purchase something from Amazon through my affiliate link I earn a small percentage at no extra cost to you. Sometimes, it's just pennies, but pennies add up over time. What do I do with the affiliate money? It has a special designation. 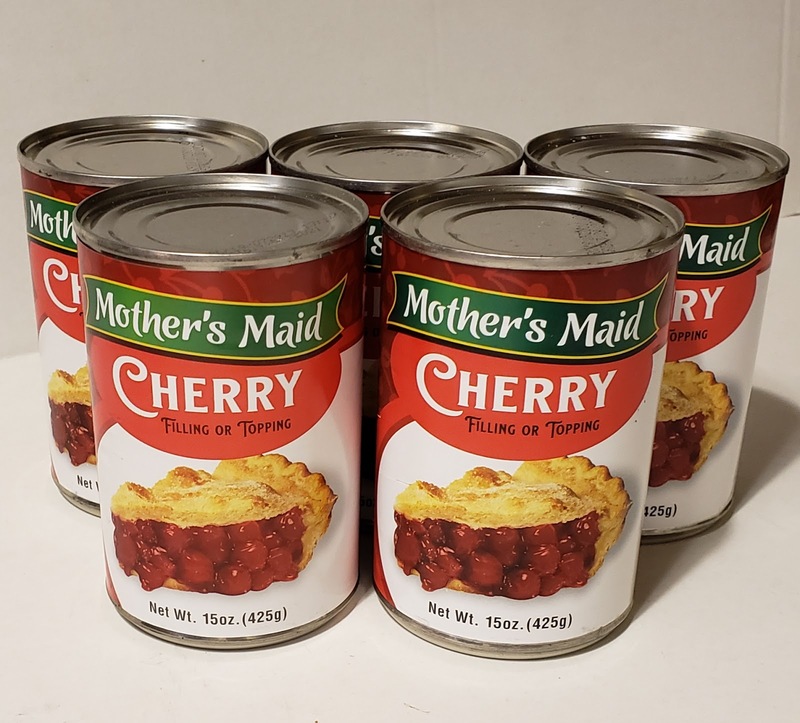 Whenever I receive affiliate money I use it to build up my pantry in supplies and equipment. I use these a lot and never seem to have enough so these have been on my wish list with the intention of purchasing them when I had enough affiliate money. Today was the day! By shopping through my Amazon affiliate link you're helping me keep my pantry well-stocked and I thank you from the bottom of my heart. I just thought you might like to know your efforts matter and are greatly appreciated! YouTube has opened up a whole new way of learning. In fact, I would go so far as to say that one could find a video on just about anything you wanted with a YouTube search. I would love it if you would share some of your favorite YouTube channels in the comments below! The events of this class were real, every single one of them; everyone in our area lived some aspect of it. This class has only touched the edges of what happened, there was so much more, but time constraints prevent me from making this class any longer. Many lost everything and had to and are having to literally start all over again from scratch, most without help from their home owners insurance or from FEMA. What about us personally? How did our property fair? How did we fair? Our only property damage was that our greenhouse sustained some damage and we had to replace the windshield in our vehicle. We were planning to expand the greenhouse anyway so it just got moved up on the priority list. We did lose power but were prepared and while there were some inconveniences, we faired quite well considering what was going on around us. We did not have any major flooding of our property. My husband and I spent 24 consecutive days, not including Sundays, doing disaster relief, helping those who lost so much. It was exhausting physically and mentally but the things we saw, the people we were able to help, the people we talked to and the gratitude that was expressed to us made every truck we helped load and unload, every box we lifted, every bag full of disaster items we handed out and every sore and aching muscle we had, worth it. What do we need to do to be better prepared for the next hurricane? Our biggest need is to have several huge trees close to our house cut down and removed, other than that, we need to keep doing what we’re doing to be as prepared as we can be for the next time. 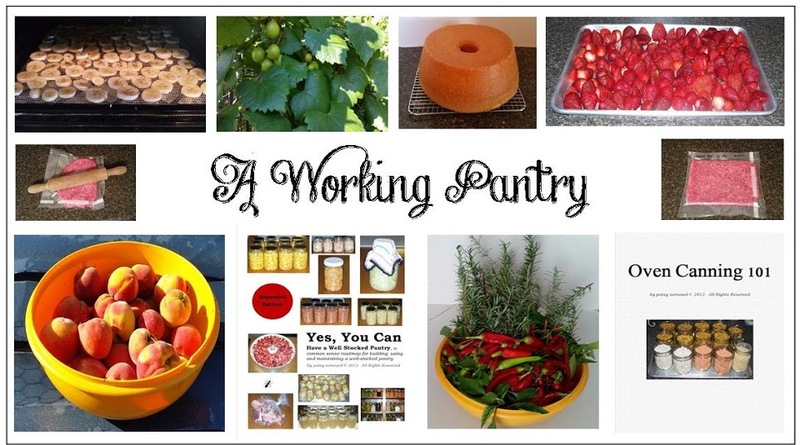 During this ordeal, because we were being bombarded with questions wanting to know what was going on and how others could help; I tried my best to post entries here on my blog, A Working Pantry, about our daily activities. You can read those ‘Hurricane Florence’ entries HERE. I’ll be the first to agree that we can’t prepare for everything, but just because we can’t prepare for everything, doesn’t mean we shouldn’t prepare for anything. Throughout this class I have tried to help you identify the things you can prepare for and do something about, I hope I have been successful! Thanks so much for being a part of this class! 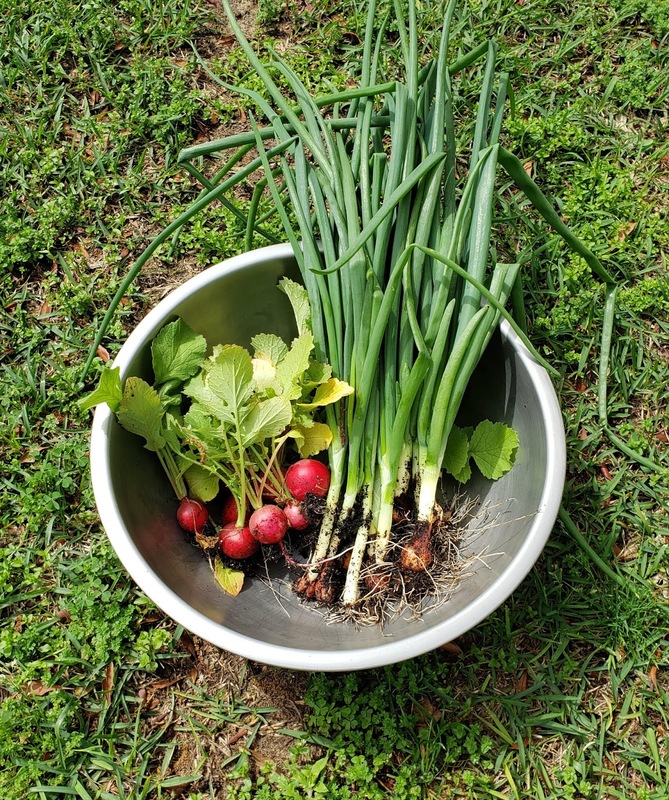 We are knee-deep in planting and harvesting … yes, harvesting! Before I share with you what we're harvesting, let me give you a tour of this section of our garden. 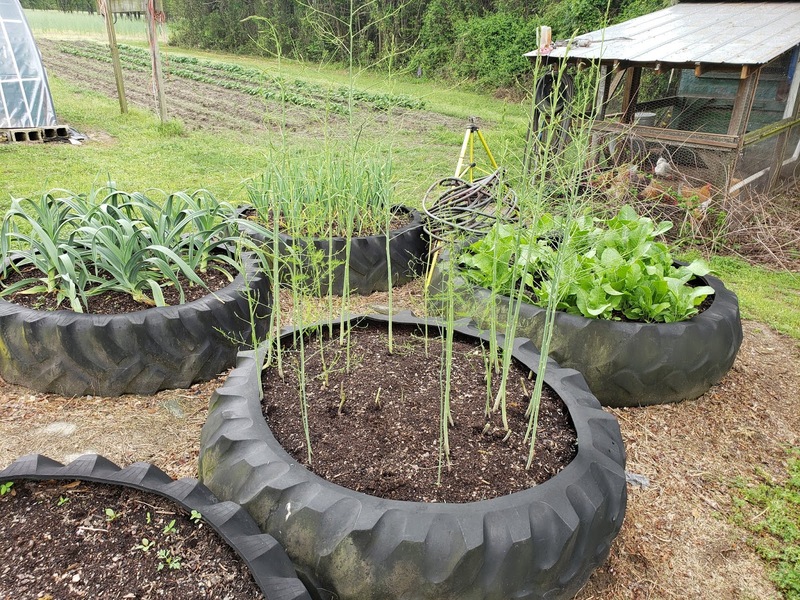 The focus of the picture are our tractor tire raised beds. There are 6 of them, starting in the lower left corner (you only see part of the tire) I have turmeric planted. It's not up yet but I'm watching it closely for any sign of turmeric life! 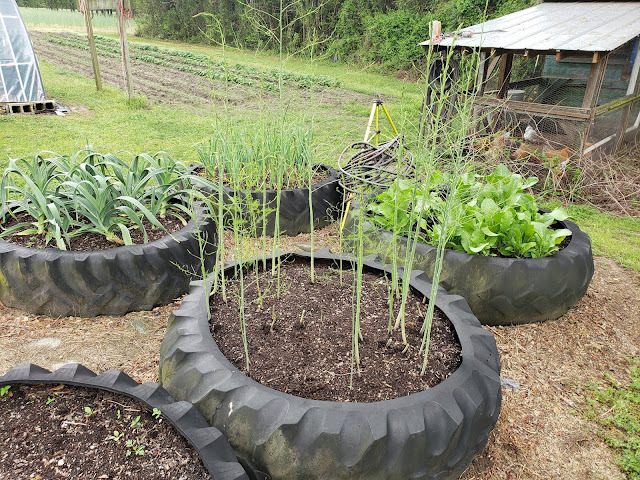 The next tire holds asparagus (we've just begun to harvest it, new shoots pop through daily). Some of it sorta of got away from us and ferned out, oh well! The next tire holds horseradish. It is literally filling the entire tire/bed! Directly across from the horseradish is Inchecium garlic (this garlic reportedly has high medicinal properties). It's neighbor is elephant garlic that I got from my mom. It is huge!!! The last tire (the one you do not see) has ginger in it. It hasn't come up yet either, but it shouldn't be much longer before it does. That takes care of our tractor tire raised beds, right next to them is our chicken coop. We wanted our garden spaces close to the chicken coop/run so that it would be easier to feed the overgrown harvest to the chickens. Not to mention, it also means we don't have as far to carry the chicken poo when it's time to add it to the soil each year! 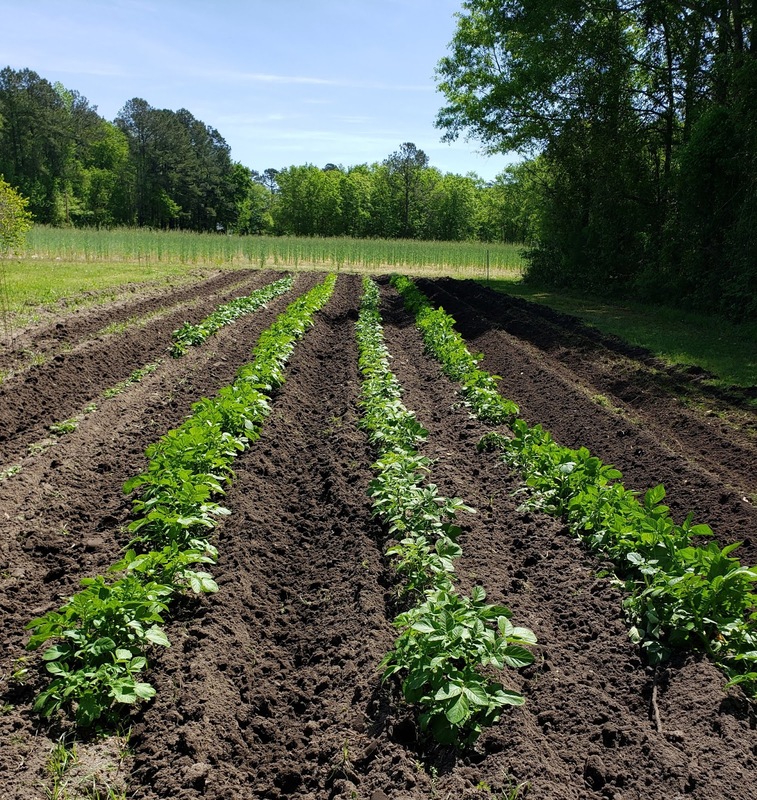 At the end of the chicken coop and around the back side are raspberry canes, they absolutely thrive in this location! In front of our chicken coop/run is our row garden. You can see our potatoes. 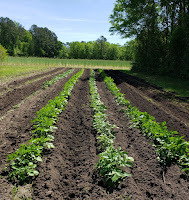 We planted Kennebec and fingerling potatoes this year. Since this picture was taken, I've planted 20 Amelia tomato plants. This is our first year to grow the Amelia variety, it was created for the southeastern part of the United States because of the unique diseases of the soil found here. Next to the row garden you get a glimpse of our greenhouse. I love having everything grouped together like this, it makes gardening easier. This is not all of our garden, we still have other areas that are grouped together in a similar way in different areas of our property. I'll share those in future posts. 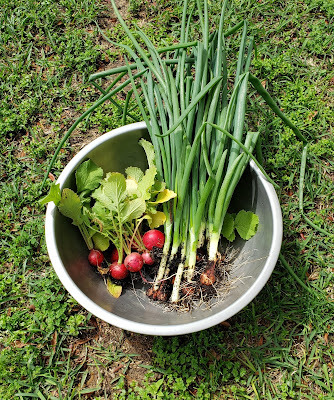 … radishes, spring onions and not shown chives and lettuce. 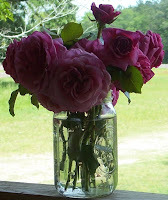 These were grown in my container garden, which is part of a future garden tour post. I hope you've enjoyed the first part of my garden tour, I'll get part 2 posted in a few days! How did your house fair? Do you have a lot of repair work to do on your house? How did you and your family fair mentally? What about water, did you have enough to meet your needs? Overall on a scale of 1 - 10, with 1 being the worst and 10 being the best, rate your assessment of how prepared you were. My last 'just one goal' was to get everything moved into our greenhouse and set up to start using. I did it, I got everything moved back in but in reality getting it all set up like I want will take several weeks/months. Why? Because some of the things we want to add will have to be purchased or constructed. At any rate, we have started! My 'just one goal' for this week is to start planting the 'warm weather' seeds and plants such as tomatoes, squash, cucumbers, peppers, etc. Our last frost date is today, April 15th, so it's time to get these things in the ground!